Toyota Coaster or Nissan Civilian – Which One Is Better ? The Toyota Coaster is a single-decker minibus produced by Toyota Motor Corporation. It was introduced in 1969, with the second generation introduced in 1982, followed by the third generation in 1993 and the fourth generation in late 2016. The third generation Coaster received a facelift in 2001, and again in 2007. In Japan, the Coaster is sold exclusively at Toyota Store dealerships. Since 1996, the Toyota Coaster is also sold under the name Hino Liesse II. A new facelift model 2018 Toyota Coaster will be available in January 2018. Toyota Coaster. is popular because it is spacious, tough and dependable and has the highest resale value. The coaster has a seating capacity of 30 passengers with every row equipped with air conditioning. The bus has a double sliding door feature for ease of access. In some versions, the sliding door can also be operated with a remote. Similar to the Hiace, the Coaster is very much valued by public transport, schools, hotels and workers. Nissan Civilian has been in production since 1959 and was introduced as an intercity public bus. Nissan Civilian is offered under Civilian, W41 or W 41 names. The Civilian comes with a 24 passenger seating capacity. 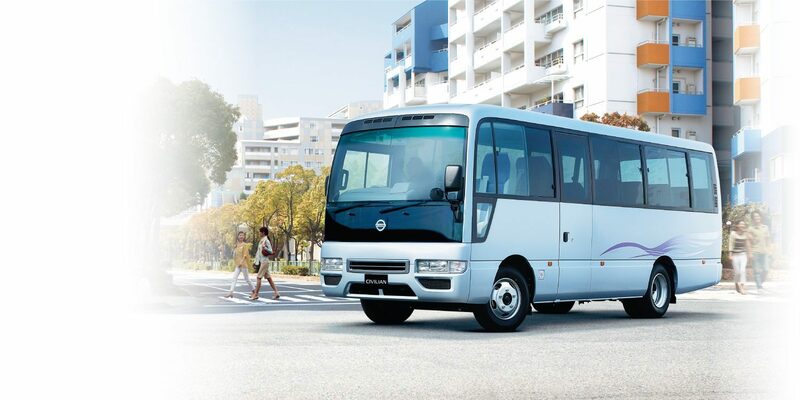 Although the Mitsubishi Fuso and Toyota Coaster are its main competitors, this article focuses on Nissan Civilian Vs Toyota Coaster. Most Toyota Coaster come with 4000cc engine. Coaster is available in Diesel: N04C Diesel Turbo and LPG gas: 1BZ-FPE. All models have air conditioning installed. The Toyota Coasters is available in both Right hand drive and left hand drive. The manual and automatic transmission, both, are available for the diesel engine however the LPG engine comes with a manual gear transmission only. It has a 24 to 29 seating capacity with two sliding doors. Nissan Civilian has a 4500cc TB45E petrol engine. Nissan Civilian is also available in both Right hand Drive and Left hand drive though generally not in current stock. It comes in both manual as well as automatic gear transmission. It runs exclusively on Petrol and not diesel. The passenger capacity is 26 to 29 persons with 2 doors. It comes in a wide range of colors, for example, white, light beige, grayish blue, silver, metallic, red metallic and blue metallic etc. Definitely Toyota Coaster. It can be fixed in any part of the world and its parts are easy to find. Almost all mechanics in the world know how to fix a Toyota. Also Coaster is generally in stock and Nissan Civilian has to be factory ordered because of its poor demand. Toyota Coaster resale value is also very high and Toyota is a very reliable vehicle.